2017 was the tipping point where the weight of evidence clearly tilted in the direction of business leaders believing Mindfulness Changes Everything in business. 2018 in all probability will expand the global acceptance of McMindfulness but also the realization that there are many deeper levels of mindfulness to be explored. Change is difficult in our lives, but within business the embracing of change is titanic in nature, business has a tendency to coop intriguing ideas and practices to the point they have little resemblance to the original. Mindfulness has often been twisted into knots before being presented as a viable tool to a companies employees, this twisting has resulted in McMindfulness, a practice that often has lost its real strength. McMindfulness is made to be accessible to everyone and requires little commitment or work of those taking it. I’ve collected 10 posts from 2017 that I think offer a broad view of how mindfulness is being used (or abused) within the worlds businesses. To understand the acceptance of mindfulness within the current business community it’s important to take the temperatures and views of differing authors. I’m not sure the author of this post actually has practiced mindfulness as he never mentions if he does, but by reading the above quote I think what he is trying to do is make mindfulness fit into his current business practice and not the other way around. To be clear mindfulness is not about “taking control of thoughts, feelings or emotions. There is not taking control in mindfulness. 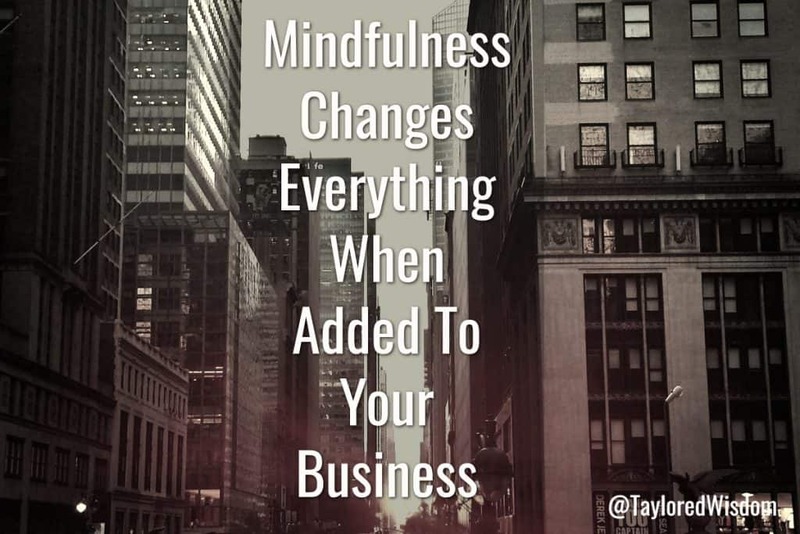 You might wonder why I would include this post if I think it misses the mark, I’m including it because it’s instructive ( I encourage you to read it) on how most business leaders still cling to their former mindset while talking about mindfulness. There is little to be gained from mindfulness if you actually have not practiced mindfulness with effort. This second post comes at mindfulness from a fully engaged yet traditional business focus. The company Jaguar Land Rover has invested time and energy into enabling many of it’s employees in taking part in the companies ongoing mindfulness classes. The author writes darkly about how stress and loss of productivity is a huge problem, he goes on to cite return on investment by embracing mindfulness. Here’s an example of the tone of the post, “We lose 40% productivity due to multitasking and distraction.” Truly a sobering quote about the loss on investment. The author does a fine job for the most part yet fails to include either quotes or stories about himself, employees or company executives and how their experience of mindfulness changes everything, or doesn’t change anything at all. There are many paths to take and techniques to try in your quest to do be more creative and develop more productive tools within your business environment. The technique of sitting in many chairs is but one of them and I couldn’t help but smile at how wonderfully it connects with my belief that mindfulness changes everything, even when it’s not called mindfulness. For a moment think about being in 10 minutes, tick-tock, before you know it those moments have vanished. Everyday we forget, misplace or deliberately toss 10 minute chunks of time away without a thought, without regret and without a feeling of loss. When we do bother to think about 10 minutes we find ourselves easily distracted, after all, of what importance are 10 minutes? This is a well written and straight forward How-To about mindfulness and gaining a toe hold, or maybe I should say gaining a mind hold into the practice of mindfulness. And if you guessed it may only require 10 minutes, you’re absolutely correct. A short, quick and yes I have to say upbeat little ditty of a post written by an author (Anne Bach Krog Iversen) that clearly has a thing for mindfulness in and out of business. I’m sure she would agree with how I titled this blog post using Mindfulness Changes Everything. Be sure to give it a read. I’m a huge fan of lists imbued with how-to’s, and this post from Helen Tupper hits a home run on both counts. She lays out clear markers on the mindfulness path such as Make Space To Think, Focus In 3 Minutes, Ask And Listen and Make A Stress Log. Tt’s short and informative, give it a read. Leadership is a bit like the top stone of a pyramid. If the capstone aimlessly wanders off the rain, snow and wind will invade the cohesion and collaboration holding the pyramid together. If leadership fails to recognize the importance of being part of the successful cohesion guiding the pyramid into historic long term success than the future is dim. This post weaves its thoughts around the role of leadership and mindfulness within an organization. And clearly points out how important it is for leadership to be at the forefront of anything it’s asking the teams to integrate into their work. We can never have too many how-to posts, especially posts that are short and full of easy to understand and carry out directions for accomplishing new things. Go ahead and add this to your favorites or your list of stress reducing, creativity enhancing and success at work tips. When you have a couple of minutes to spare (you do have a couple of minutes ) bring out this posts and jump in, and remeber Mindfulness Changes Everything.